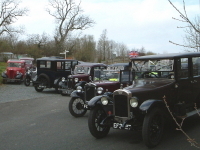 FBHVC states: "The primary aim of 'Drive it Day' is to showcase the historic vehicle movement. The historic vehicle movement, the FBHVC surveys have showed, is a significant contributor to society: hundreds of thousands of people derive pleasure from it, tens of thousands earn some or all of their income from it, and it contributes over £3 billion to the national economy. All of that depends on freedom of use: lose that, and the movement will, inevitably, decline. To uphold the freedom we need, above all, to keep legislators on our side. Two things that always weigh heavily with legislators when they are considering new measures are, first, the number of voters who will be adversely affected and, second, whether the benefit resulting from the proposed measure is sufficient to justify upsetting that number of people. 'Drive it Day' helps both: it shows the large numbers, and by making an obvious contrast with the other days in the year when it is rare to see anything over 20 years old, it shows how little historic vehicles are used. It thus demonstrates that restrictive measures will have negligible benefit on emissions, but would upset large numbers of people. 'Drive it Day' also celebrates the '1000 Mile Trial' which left London on 23 April 1900." To achieve that FBHVC encourages member Clubs to organise an event on the Sunday nearest to 23 April each year. 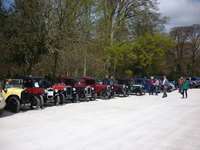 NB: 'Drive your Austin Day' in 2006 to commemorate the '1000 Mile Trial' was originally the idea of the Austin Ten Driver's Club. It was picked up by FBHVC a year later and promoted nationally as 'Drive it Day'. Each year we organise a Club run to support 'Drive it Day' so that as many people as possible can see us enjoy driving our 'Sevens' on the public highway and be able to come and meet us whenever we stop. For these runs we keep to the main A and B roads and aim to meet at a well known venue, frequented by visitors, where we can park for about three hours so that they have plenty of time to come and chat to us. 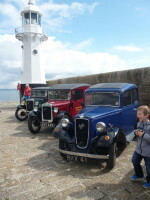 This article is added to each year after we have enjoyed another 'Drive it Day'. For this year's event the Committee left it to members to organise a local event. From Callington, East Cornwall - two members took their Sevens out to Lifton for a spot of lunch. Perfectly timed as we beat the twenty-odd MGs and Austin Healeys to the restaurant! We stopped for a photo at Horsebridge, ten yards into Devon. From Blackwater, near Redruth - we met at the Penventon Nursery, Lanner, for an afternoon run unsure of what the weather had in store for us as it was overcast with some dark clouds - but we were not put off. 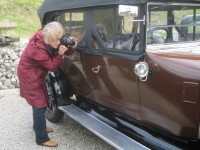 We travelled through Stithians and down to Mabe Hall where we were joined by an Austin 12. We then travelled down through Halvasso and Constantine and arrived at the Potager Garden for afternoon tea and cake. Whilst here we were blessed with gorgeous sunshine again which made the day very enjoyable for all. It was lovely and warm walking around the gardens and the children had a great time running around the grounds, playing table tennis and swinging on the hammocks. From Bodmin, mid-Cornwall - True to the spirit of ‘Drive it Day’ five cars in the Bodmin area duly assembled on the Saturday morning at Lanivet New Village Hall and headed into Bodmin town centre to be seen by the public. Strangely, the few people on the streets hardly showed any attention, despite repeated horn activity too attract attention. The cars then headed north on the ‘Judge’s road’ to an equally quiet Blisland and over the Bodmin Moor to St Breward, passing the highest pub and Church and onwards through the moorland lanes to Higher Town ford for a photo stop. A rapid detour from there to Roughtor, where the vista of the peak and Brown Willy was shrouded in fog led to a chilly run to Crowdy Reservoir near Davidstow. Driving drizzle caused a change of venue for the picnic and after the photos, the little formation headed for the hamlet of Bowithick where lunch was enjoyed down by the ford. The warmth of the Rising Sun at Altarnum beckoned and the five cars and their occupants continued up the winding valley to the Inn which appeared to be empty on our arrival with loads of cameras, phones and tablets in action. We had been recognised at last! 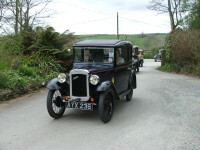 The local ale was appreciated, and the cars went home by various routes to Bodmin, Camelford and other locations south west. Despite the poor weather a good time was had by all and our babies were perfectly behaved with no breakdowns! 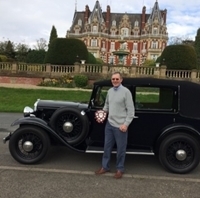 and a trip up-country - one member his Austin 16 from St Austell to the Vintage Austin Register's National Rally and Sixtieth Anniversary Celebration held at Chateau Impney, Worcestershire. 531 miles round trip! 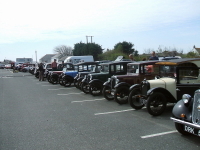 From the West - The weather for Drive It Day 2016 was perfect – bright blue skies greeted seven Austins in the lay-by at Perranarworthal, gathered for the convoy to the Falmouth Arms at Ladock. Our happy band included a 1936 ex-London Taxi, with passengers, and an Austin Twelve, this being the one event in our calendar when members can drive any pre-war Austin. The route from Ladock used roundabouts as the key navigation points on a trip through the Ladock Valley, Wadebridge, Bodmin and in to Lanhydrock. As we stragglers arrived at the National Trust House, we were redirected to a lower car park as over 20 Austins had taken up the main car park. Meanwhile from the East - Sunday morning dawned bright, but breezy, and the weather boded well for the run down to Lanhydrock to meet up with the other club members for the annual Drive It Day outing. 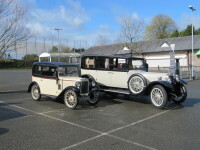 Three cars from the East End met in the New Road car park in Callington; a Ruby, a PD 2 seat Tourer and a Box. After the compulsory catch up and chatter, we made a prompt getaway at 10:30, heading out through Callington toward Liskeard, then north to Pensilva at St Ive. Rather than drive the main roads, we decided to stick to the smaller, and hopefully, less busy roads and lanes, to make our way via Crows Nest, St Neot and Fletchers Bridge to Lanhydrock House. 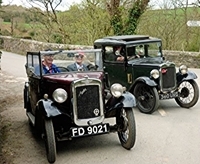 Members also found their own way to Lanhydrock from Wadebridge and St Austell areas so that twenty four members from all over the county met up to chat and renew old friendships.. It was surprising how busy the minor roads were; maybe the weather had brought out all the Sunday drivers. Having descended en-mass on the NT coffee shop and restaurant, we took a break from chatting to the visitors. A well earned picnic was partaken in the gardens as we made the most of the sunshine. It was lovely to have 'Drive It Day' at a venue where there was interest for the car buffs, families and places to wander around the house and gardens.
. . . . . with a change of format this year local groups were left to make their own arrangements to meet and choose their route to Mevagissey. 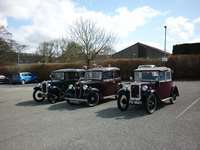 Our run is open to all pre-war Austins bu tthe only non-seven was the 1936 ex-London Austin Taxi but it wasn't a large turn out this year. Seven cars met up at Blackwater lay-by, near Redruth, and went to Truro via Station Hill and then through the town, on to Tresilian and Grampound where they turned off the main road and headed to Mevagissey across country. 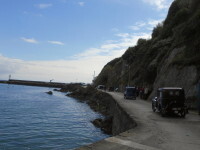 Being the first to arrive they drove out to the end of the harbour wall, beside the small lighthouse and parked 'fishbone' style facing the harbour. Soon after they were joined by the four cars from the Falmouth area who had followed to main road to St Austell before going south through London Apprentice, and one which had a solo run from Callington. The roads seemed unusually quiet on the Classics front this year with few other clubs in evidence. Although not the brightest of days so far this spring, the weather remained co-operative. The Sevens made a splendid background to views over the harbour and there was a steady stream of people taking the long walk to the end of the pier to look at the cars, chat to their owners and take photos. Many were surprised that we still use our Sevens regularly, and there were a few raised eyebrows at tales of France, Spain, upcountry and plans for further afield. For 2014 We were seen . . . . ..
. . . . . on the county’s roads as the weather turned to good and members drove from all 7 start points to meet at the Classic Air Force Museum, Newquay. There were 26 ‘Sevens’, two ‘Twelves’ and the ex-London Taxi lined up, and joined by 12 members of the Cornwall MG Owners Club so it was an interesting display for the other visitors to the museum to look at. The total of 29 pre-war Austins was a good turn-out which included a few members not previously out for an event, or are seldom, seen. The small museum of aircraft from the ‘cold war’ period was very interesting with many volunteer staff available to answer questions or to offer a tour of the two aircraft stationed outside. In 2013 - 24 cars gathered at The Lost Gardens of Heligan, near St Austell, including five VAR and ATDC members with their 'Twelves' and 'Tens'. Most of our members covered about 35 miles from the usual start points but two had longer runs from Carbis Bay in the west and from Yealmpton, South Devon, each taking about 60 miles to get to the Gardens. Our event to support ‘Drive it Day’ is a cross between a run and a show display with a chance for members to visit a place of interest and many did enjoy a walk through the gardens. The LGoH website had listed our display and many visitors chose to visit the gardens on the Sunday so that they could also see our cars. During the late morning there were many interested folk admiring the quality of restoration and care, marvelling that we do drive them regularly. Several people from the visiting coach parties came over, probably unsure of what a ‘Display of Pre-war Austins’ meant. These included a group from Germany; isn’t it nice to tell them about the first Dixie, later to be part of BMW, was built on an Austin Seven chassis and engine, and some do know that! Many photos were taken, what will they do with them? There were the usual questions about spares, fuel and the cost of buying one, as well as those who had owned one which was a Morris, an MG or Triumph! Sadly the rain caught up with us in the early afternoon and with the visitor number dropping quickly it was time to depart. Meanwhile the members of our North Devon Group met at Allers Cross and then enjoyed a cross country route to Tiverton where they had the option of an afternoon trip on a horse-drawn barge along the local canal. 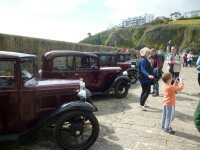 For 2012 - We returned to Tintagel with cars starting from the usual six places across Cornwall and North Devon. Unfortunately the weather was wet, windy and cold and so support for the 'King Arthur's Run' was not quite so good as in previous years. Those starting from Truro, Blackwater and St Austell met with local members at Trelawney Garden Centre, near Wadebridge, and put on a display in the car park for an hour which attracted much interest. 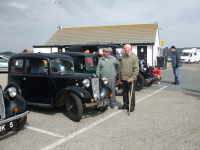 By the time these groups arrived at Tintagel, to be joined by those from Callington and Bideford, the weather was definitely not to our liking; this reflected on the smaller number of people around who wished to look at the cars and chat to us. Despite the poor weather there were 23 'Sevens', 1 'Ten' and 4 'Twelves' with our friends from ATDC and VAR which formed a display for a few hours. Inevitably we decided on an early departure and we made our separate ways home. 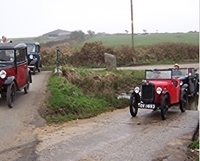 Many people across Cornwall saw our 'Sevens', 'Tens' and 'Twelves' on the road during the day as we enjoyed the right to drive our old cars on the puiblic highway. 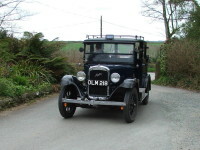 In 2011 - Our run saw 33 pre-war Austins in East Looe with one coming from Penzance, eight from Helston & Falmouth; others came from Camborne & Redruth, Wadebridge, St Austell and Callington with five from Bideford & Barnstaple and one from Yelverton. Altogether there were 23 ‘Sevens’ with seven ‘Twelves’, two ‘Tens’ and a 1937 ex-London Taxi complete with period luggage, which attracted a lot of attention with many children enthralled by the opportunity to sit in the driver’s seat and toot the bulb horn. 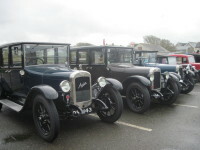 A few members, and our friends in VAR and ATDC, came along with a range of Light and Heavy Twelves with two now very rare Austin Tens, a Gordon bodied ‘Moth’ and a resplendent model with a ‘dickie’ seat and both attracted a lot of attention due to their immaculate condition and distinctive appearance. With pre-event local publicity, and having a few cars driving through the narrow streets before entering the car park, we attracted the attention of the many people in East Looe as there was a non-stop stream of people throughout the four hours we were there, with, as usual, many reminiscing of the time when our cars were common on the roads to the youngest who were delighted to be offered the chance to sit in several of them. A successful day with many people across Cornwall seeing us enjoy the right to drive our cars on the public highway. For 2010 - We started from five places across Cornwall and North Devon and were able to give our members a chance to meet at one venue, The Cobweb Car Park in Boscastle where 26 Sevens, an Eight and two Twelves attracted a lot of attention from local residents and visitors during the three hours or so that we were parked.. 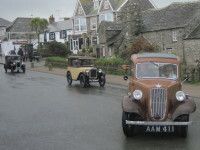 In 2009 - The turn-out of 29 pre-war Austins, mostly 'Sevens' of course, arrived at Pencarrow House, Washway, near Bodmin from five starting points. Our North Devon Group of five 'Sevens' enjoyed a drive along the north coast road to Widemouth Castle. 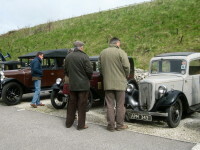 For 2008 - We introduced a different format when we agreed to make this event the one occasion in the year when we would include all pre-war Austin models so that some of our members could drive their 'other' Austins. We also extended an invitation to the Vintage Austin Register (VAR) and Austin Ten Driver's Club (ATDC) to join us. We met at two venues with members in East Cornwall and North Devon visiting Dingles Steam Museum, providing a turn out of 18 'Sevens' and 5 other models . . .
. . . . whilst West Cornwall members met near Truro. The 10 'Seven's and a 1936 ex-London Taxi ventured through the towns of Redruth, Camborne and St Ives to meet at Geevor Mine. The return route via Penzance and Marazion brought us into contact with many more people anxious to chat with us. 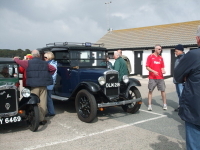 In 2007 - We supported 'Drive it Day' and had a 'Run to Tintagel' with our members starting from several places across Cornwall. This was an excellent turn-out with 34 'Sevens' lined up across the car park. The format of several starting points worked well, it brought more members out for the run and exposed our 'Sevens' to a lot more people. 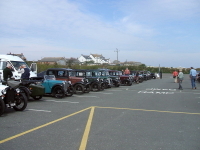 In 2006 - On 'Drive your Austin Day', promoted by the Austin Ten Driver's Club, we had a short run to Lands End where 15 'Sevens' were able to park in The Square.